Whether it’s running a marathon, brunching, sending him on a mini-vacation or taking him to an auto show, make sure to give your favorite father figure lots of love on Father’s Day. Or, if you’re a daddy yourself, make sure you get to do what you want to do for the day! I’ve compiled a list of 10 different ideas to help make this Father’s Day one that’s never forgotten, no matter the budget, time frame or location. Many #WilsonsGuide favorites—places that I’ve already recommended and written about on my blog—have made the list, and I’ve also caught word about a few other new locations that definitely are worth checking out. So read on, and let me know where you end up going! The Eats + Drinks: A four-course, prix-fixe menu and select bourbon and beer options. When-To-Go: Father’s Day, Sunday, June 15, starting at 5 p.m. The $ Factor: $27 for the prix-fixe menu; bourbon and beer pricing varies. The 4-1-1: A past #WilsonsGuide selection, CHAYA Downtown’s prix-fixe menu will feature the Whisky Marinated Chicken “Tsukune” & Shrimp Brochette with chipotle bourbon sauce and summer squash. If you’ll be on the Westside, CHAYA Venice and CHAYA Beverly Hills are adding BBQ-inspired dishes to their regular dinner menu, including the Grilled Harissa Chili Marinated Beef Rib with grilled organic corn and the Coffee Rubbed BBQ Kentucky Pork Riblettes with South American yucca fries. Bourbon and beer specials will be available at all three CHAYA locations. 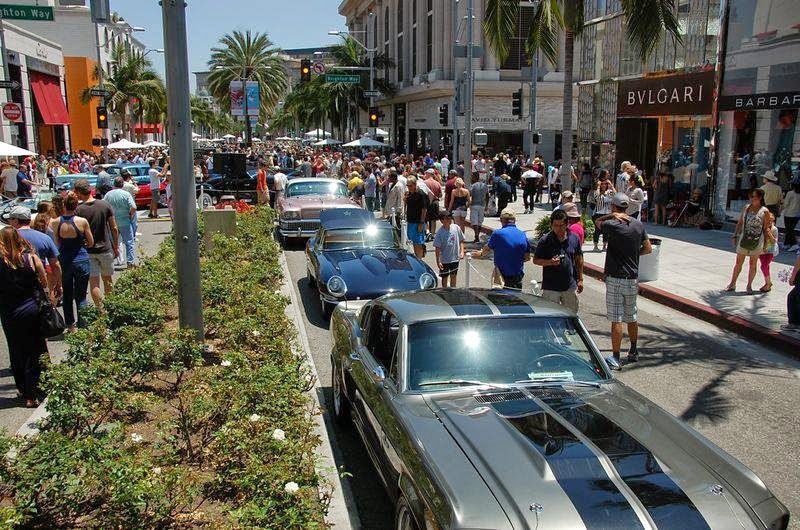 The Merriment: The ultimate automotive experience, featuring scores of luxury cars prominently displayed on Rodeo Drive. The 4-1-1: The Rodeo Drive Concours d’Elegance is an annual event that has taken place on Father’s Day for the past 21 years. For 2014, it’s recognizing Beverly Hills’ centennial with the theme “100 Years of Horsepower,” specifically showcasing luxury cars from the past century, including cars that have been owned by Hollywood household names like Fred Astaire and Howard Hughes, and ones that have made appearances in films like An American in Paris and TV shows like “Entourage.” From the widely recognized Wells Fargo Wagon to celebrities’ personal cars and Maserati’s new GT MC Centennial Edition Model, which will be revealed for the first time in honor of the carmaker’s 100-year anniversary, there’s plenty to see. 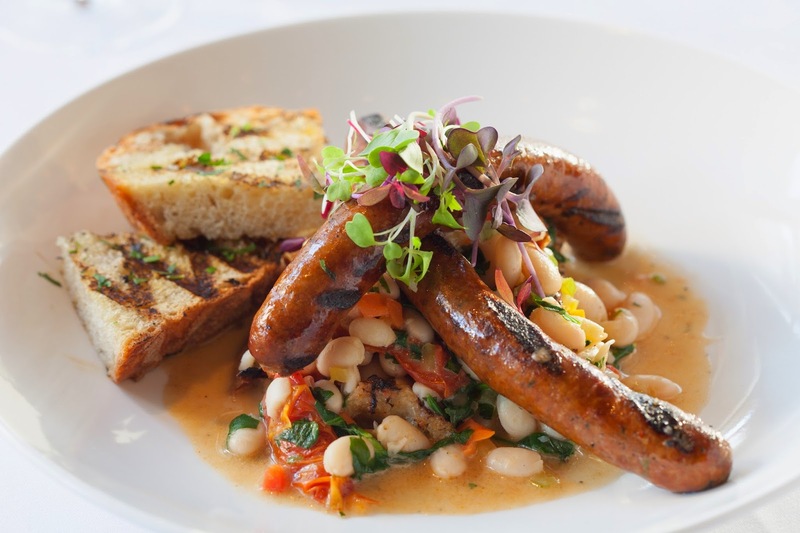 The Eats: A brunch buffet with an emphasis on grilled meats and artisan sausages, including Lamb Merguez (pictured above), Venison and Blueberry, and Wild Boar and Cranberry. When-To-Go: Father’s Day, Sunday, June 15, 11 a.m. – 3 p.m. The 4-1-1: Meat-lovers, rejoice. A #WilsonsGuide selection, Napa Valley Grille, will be cranking up the grill this Father’s Day, with roasted prime sirloin, bratwurst and andouille, and a variety of artisan sausages. Other brunch options include made-to-order omelets, seafood, a Spring Grilled Vegetable Salad, Steak Hash with Poached Eggs and Marinated Grilled Natural Salmon. What’s nice about this restaurant is how accommodating they are to all group sizes; it has a variety of charming nooks and crannies to dine in and also a fantastic outdoor patio to enjoy the summer weather. The Eats + Drinks: Libations creatively made with coffee and beer along with food stations manned by some of the city’s most prominent chefs. When-To-Go: Saturday, June 14, 11:30 a.m. – 3:30 p.m. 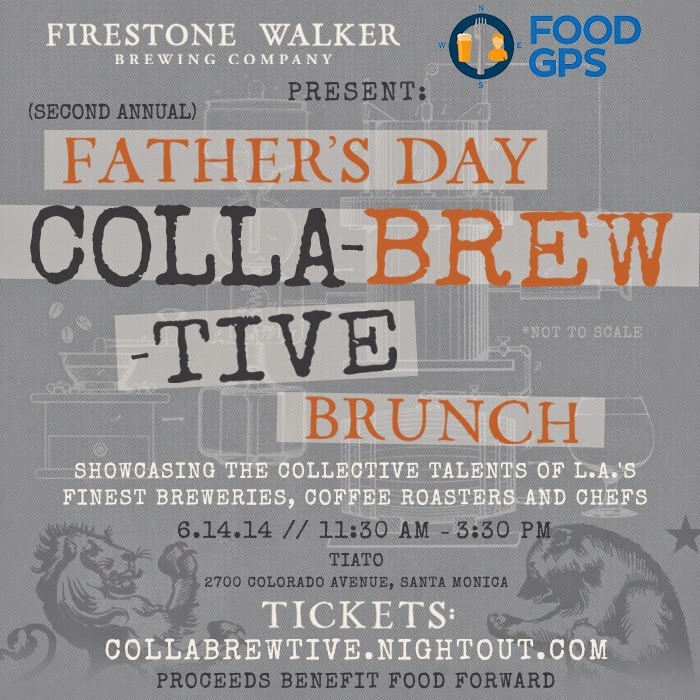 The 4-1-1: Firestone Walker Brewing Co. and Food GPS are presenting the ultimate day of sampling. Local breweries have paired up with coffee roasters to create unique beverages, such as "Rice & Beans," a beer inspired by coffee-infused horchata from The Bruery and Tierra Mia Coffee, and the "Bourbon and Bliss,” a bourbon barrel aged Standard Crude American Imperial Stout with espresso, made by the El Segundo Brewing Co. and LAMILL Coffee. There will be multiple food stations where chefs are offering their twists on traditional brunch items; for example, Ernesto Uchimura of Plan Check will be making the Mancake Plate—silver dollar beer pancakes with bacon, maple glazed smoked heritage pork sausage and sunny fried quail egg. You can check out all of the food and beverages options for the day in advance, on the website. A portion of event proceeds will be donated to Food Forward, an organization that gives fresh local produce to local food pantries. The Merriment: An annual outdoor festival for all ages to enjoy, featuring live music, performing arts performances, cooking demos and more. When-To-Go: Saturday, June 14, 10:40 a.m. – 6 p.m. 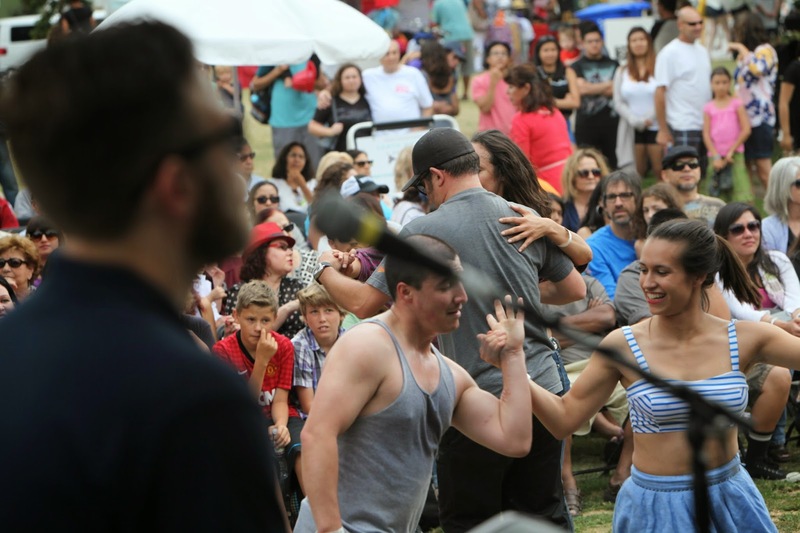 The 4-1-1: The 23rd annual Santa Monica Festival will take place the Saturday prior to Father’s Day. Similar to previous years it will feature tons of things to do, from kid-friendly activities like a Fun Flash Mob to art-centric activities, including a Drum Circle and a bluegrass band concert. And in case you need to purchase any last-minute gifts for dads, uncles, brothers, etc., make sure to check out the festival’s onsite marketplace. The Eats: Seasonally driven, French Riviera-inspired cuisine. When-To-Go: Father’s Day, Sunday, June 15; brunch (12 – 3 p.m.) and dinner (6 – 10 p.m.); dinner wine pairings available for an additional $25. The 4-1-1: Here’s another #WilsonsGuide favorite, which doesn't just appear to be a top choice for me, but is also one for President Barack Obama, President Bill Clinton and singer Julio Iglesias, as they’ve all allegedly dined here as well. For Father's Day, Fig & Olive rolling out a brunch that will include Beef Tartar; Crab Cake Eggs Benedict with Tomato Paprika Hollandaise Sauce; and Petit Filet Mignon with haricot vert, caramelized shallot and chive mashed potato. For dinner, Fig & Olive will offer a Primavera Lobster Risotto with asparagus, caramelized carrots and baby zucchini; Seared Yellowfin Tuna A La Provencale with ayala spice, heirloom potato and eggplant caviar; and a 21 Day Dry-Aged Sirloin with confit heirloom potato and red wine cremini mushroom. Also, Fig & Olive Newport Beach will offer a three-course prix-fixe brunch and dinner, with different menu options. The Eats + Drinks: Steaks and craft beer. The 4-1-1: If Dad is a meat-and-potatoes guy, take him to Morels to get a Bone In New York Sirloin 20oz. with Baby Carrots, Potato Puree and Sauce Bordelaise. This cut will be paired with the Anchor Steam “California Lager” craft beer. Located at The Grove, Morels has a great outdoor patio to people-watch and experience the hustle and bustle of one of L.A.’s most sought-out shopping centers. The Merriment: Timed runs on an open course. When-To-Go: Father’s Day, Sunday, June 15; registration opens at 6 a.m. and races start at 7 a.m. (except for the marathon, which starts at 6:15 a.m.). The $ Factor: $19.49 – $43.99, depending on which race you participate in. 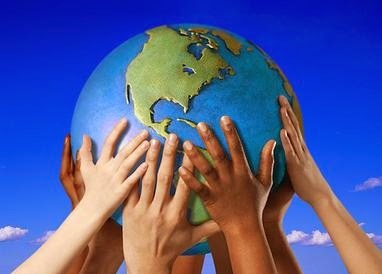 You can also run for free if you, a family member or a friend serves as a volunteer. The 4-1-1: Help ensure that Dad lives a long and healthy life by getting some early Father’s Day morning exercise in! The organizers of the event, A Better World Running, are advertising the race as very casual and informal, with an emphasis on getting outside and having a good time running, rather than intensely competing. Register in advance or onsite the day of the races. All runners will receive medals, "goodies," snacks and water. The Merriment: A classic American pastime and an L.A. favorite: a baseball game. When-To-Go: Father’s Day, Sunday, June 15; game time 1:10 p.m. The 4-1-1: Why not take Dad out to a traditional pastime that millions of Americans have gone to for decades? The Dodgers have already won the majority of games of against their rival, the Diamondbacks, in this National League West matchup, so hopefully, they’ll pull another victory at this game, too. Complimentary Father’s Day Sports Day bags will be given out. The Merriment: A one-night stay in a Standard King Bed Room, dinner or brunch at The Churchill and a “Gentleman’s Hair Cut and Proper Shave” at Proper Barbershop, nearby, on Third Street. 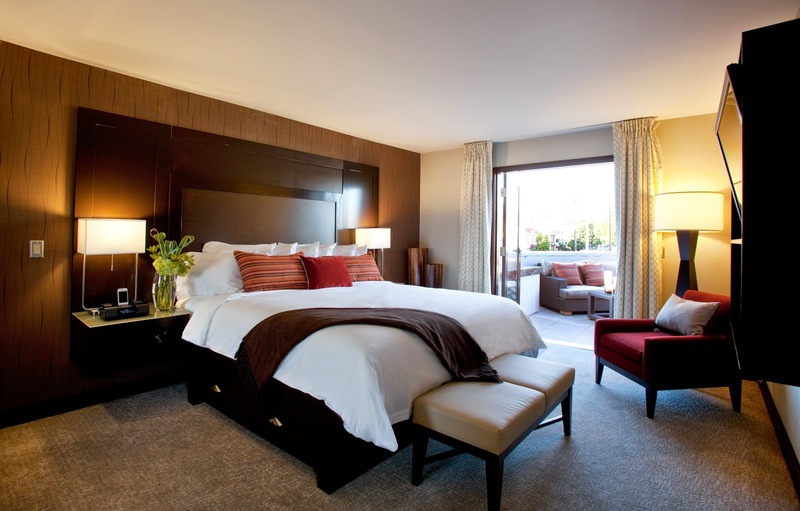 The 4-1-1: Spoil that special man in your life rotten by letting him have a mini-vacation in the city, with a stay at this boutique hotel that’s on the corner of Orlando and Third Street, right in the middle of the bustling dining and shopping district “West 3rd Street,” and a few feet away from the Beverly Center. Surprise, surprise--The Churchill is another #WilsonsGuide restaurant that comes highly recommended, with seasonal American dishes that he'll hopefully enjoy. It's located right in The Orlando Hotel, so he won't have to go far for dinner or brunch. And, a visit to Proper Barbershop will have him looking dapper for Father's Day and beyond.